When asked why they are conservatives, Heritage Foundation members Charles and Anne Willey have a ready answer. Personal liberty, self-reliance and limited government are important principles, they say. And Americans, they add, do not need or want meddling, ill-informed government butting into their lives. The best government, in their view, is a limited government defined by the rule of law. Problems are best solved, innovations are created and the human condition is improved when individuals and voluntary associations of individuals act in their mutual self-interest. We are deeply frustrated with a government which manipulates its citizenry through tax incentives and entitlements to encourage dependency, picking winners and losers, and swelling the debt and budget of the country. We are frustrated with a government which over-criminalizes its citizenry to engineer liberal progressivism into all parts of our lives: our health care, our families and social choices, our education, our energy choices, the media, and our businesses and banking enterprises, among others. Working in the health care industry, the Willeys are adamantly opposed to Obamacare and are certainly not shy about sharing their views. In St. Louis, they organized a “Prevent Obamacare” event, which drew more than 150 guests, including 75 doctors. In addition, they have hosted citizens events on the perils of Obamacare and the importance of Heritage’s Saving the American Dream plan, which would repeal Obamacare and fix the federal budget. These latter events each attracted more than 500 guests. Anne and Chuck Willey outside "Heritage Tavern", a quarterly event hosted by the Willeys that supports Heritage research. 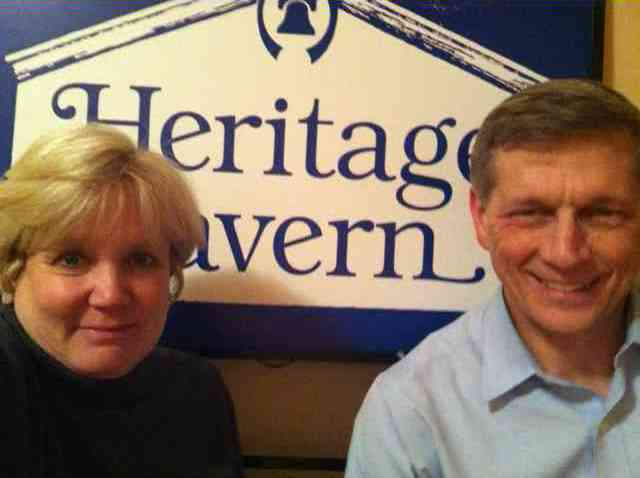 The Willeys are perhaps best known in St. Louis for their Heritage Tavern events. Every couple of months, the Willeys gather about 75 conservatives at a local pub to hear from Heritage experts and discuss the day’s pressing issues. The Willeys have hosted (either in person or via Skype) Heritage experts including Jim Carafano, Mike Franc, Bill Beach and Bob Moffitt, just to name a few. “Heritage, including Jay Rinehart, has been especially supportive of our grassroots efforts to inform a more recently engaged group of citizens,” Anne tells us. Daily readers of The Foundry, the Willeys keep up with Heritage research, analysis and commentary and pass it along to their friends. Chuck intends to use Heritage research on the effects of Obamacare to rally doctors and patients to an Obamacare protest outside the Supreme Court. He even plays Heritage videos on a loop in his medical office waiting room. So what’s next for the Willeys? For starters, they are exploring hosting a series of movie nights to present films such as Waiting for Superman and 33 Minutes. They’d also like to establish a conservative book club and start a local blog to share event and political information. Avid believers in the Constitution, the Willeys are always looking for new opportunities to share America’s First Principles in their community. The Willeys have enjoyed 31 years of marriage and have four grown children. Anne is a Long Island native and a graduate of Washington University Law School. A St. Louis native, Chuck is a graduate of the University of Missouri Medical School. Today he’s a general internist with 30 years of private practice under his belt. It’s because of Heritage Members like the Willeys that The Heritage Foundation has grown its size, strength, and influence across the country. To Anne and Chuck, thank you for your loyal support for the conservative cause. We are truly humbled to count you as Members. Let me know when you have your next event in St. Louis. I’m very interested. Keep up the good work. Wow, this couple is certainly an inspiration to us all! Thank you Willeys for your work to engage and inform the citizens of St. Louis! 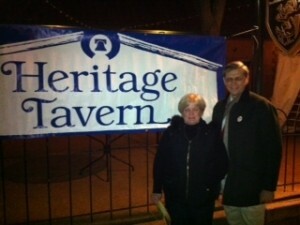 I was impressed by your “Heritage Tavern” story, thanks! Please let me know when you have your next meeting. I would like to attend also. Bully for you, I am enbolden to carry on the fight. When I see people or read a story like yours. Thank You. Carry on! Hello from Columbia, IL. Would love to know when your next event is. Additionally all conservatives need to see the American Heritage Series put out by David Barton at Wallbuilders.com. This is History that anyone who was in public school from the late 50’s on NEVER heard. I would like to be involved in defeating Barack Insane Obama this November. Any suggestions? Reading this post is my FIRST knowledge of and contact with Heritage Foundation. I must say I am VERY impressed!! Thank you both for what you are doing!! My husband and I have been very disturbed at the direction ‘some people’ in our country are trying to take us. So very thankful for strong, knowledgeable folks like you, leading the way! I lost my wonderful husband, a Linguistics Professor, in February, and am not yet sure about our finances – but feel this is a VERY worthy cause, so will read more of these posts, and my daughter and I will be making a contribution. May God Bless you, and bring our wonderful country back to it’s former greatness! !